This plastic and paper sheet cutter with concealed blade provides swift and reliable accident-proof cutting. 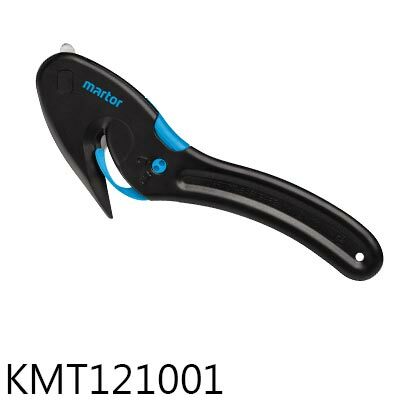 The patented cutting head design allows easy initiation of the cut while maintaining blade contact with the material, even on single layers of film or paper. The piercing point allows insertion into all types of paper and plastic sacks. The integrated tape slitter safely cuts packaging tape without an exposed blade. The Easysafe has been recognised as a superior cutter, gaining an honourable mention in the 2010 red dot design awards, and being named product of the year by pro-K (pro plastics) federation in Germany. 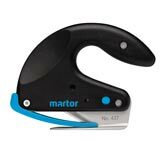 Martor safety knives and safety cutters are fully tested and approved by the German Safety Control Board TÜV. Interested in award winning design and exceptional performance? Try the Megasafe Heavy Duty Cutter. 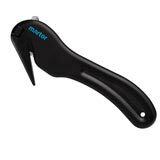 For complete operator safety and superb value choose the Economy Safety Cutter! 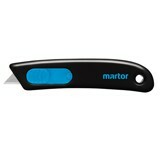 We always keep Martor safety knives and cutters in stock ready for same day dispatch, so you need never lose your cutting edge. Save up to 20% on larger orders!